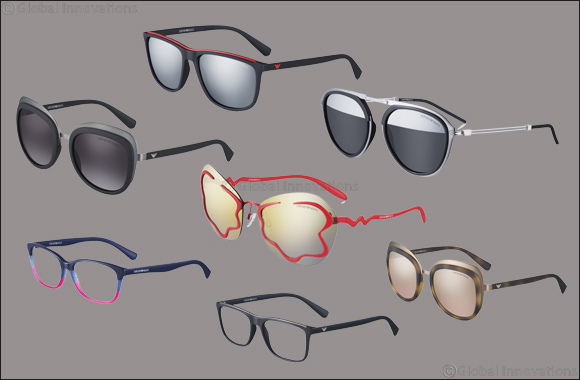 Dubai, UAE, March 29, 2018: The new Emporio Armani eyewear echoes the eponymous fashion collections in a play on contrasts. Men’s and women’s models dialogue, opposites attract and merge in a mix of materials and colours. Striking details in all the styles reinforce the strong brand identity. Comfort and fit for all is a key feature, the frames are constructed with charisma and flair. A perfect match of design and functionality. EA 2060 - Quintessentially feminine, this rimless frame reflects the flawless elegance which is indicative of the label. Producing a look with immediate impact, the floral theme of the Emporio Armani Fall/Winter 2017/2018 fashion show reprises in the rippling metal detail around the lenses and the laser-engraved logo further accentuates rippled temple arms. Available in red with light brown lenses and gloss gold with light brown mirrored lenses. EA 2058 - Metal fuses with nylon fibre in an ample, round frame front. Feminine with a sophisticated touch, these glasses leave a lasting first impression. Sleek nylon temples feature the archetypal Armani eagle in metal. Available in matte black with a gunmetal grey frame front upper and grey gradient lenses and in havana with a matte bronze frame front upper and light brown mirrored lenses. EA 3126 - Chic and timeless, the three-colour, top-down dark to light gradient frame front makes for a distinctly attractive look. A lively pair of specs in acetate, shades range from deep reds to vivid greens. Topped off by the discreet and definitive Armani logo, nylon fibre temples mirror the colour hues in the frame front upper. Available in gloss grey, bottle green and transparent aqua blue or in polished purple, blue and pink strawberry. EA 2057 - Inspired by winter goggles, this bold and futuristic model reflects the revolutionary spirit of the label which was presented at the show. Ultralight frames, bridge and lenses sport geometric shapes, sharp cut edges and openwork cutouts. Featuring the iconic eagle logo, sinuous tubular metal temple arms are a unique design with an equally unique weightless feel. Available in petrol blue or rose gold, both with mirrored lenses. EA 2056 - Also appearing in the Emporio Armani show, this model marries contemporary design with comfort and a lightweight feel. The contrasting metal frame and round nylon fibre frame front merge with a bridge that juxtaposes thick with thin. Sleek double metal temples mount directly to the frame front and the iconic eagle logo takes pride of place atop the hinges. Available in polished gunmetal grey with a gloss black frame front and silver/smoke grey mirrored lenses and in light matte gold with a gloss green/havana frame front and mirrored petrol blue lenses. EA 4109 – EA 3124 - Counting on contrasts, the look of this model is all urban. The nylon fibre frame features a contrasting metal core in the frame front upper for an original mix of materials. Also in nylon fibre, temple arms showcase the Armani eagle logo. Available in matte black with matte red metal details and black mirrored lenses, in deep matte brown with orange metal details and red mirrored lenses and in matte red with matte black metal details and dark smoke grey lenses. Slightly more square in shape, eyeglasses mirror the style of the sunglasses. Available in gloss black with gunmetal grey metal details and in matte red with matte black metal details.